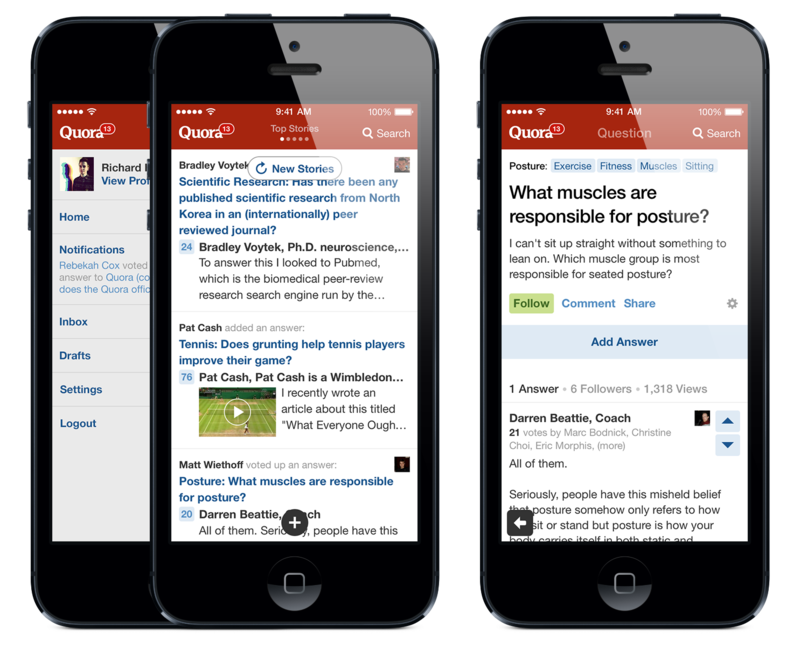 Quora, the Q&A social network, released today an iOS 7 update to its mobile app that is more than just a redesign — it has been rebuilt from scratch to put more emphasis on reading questions. 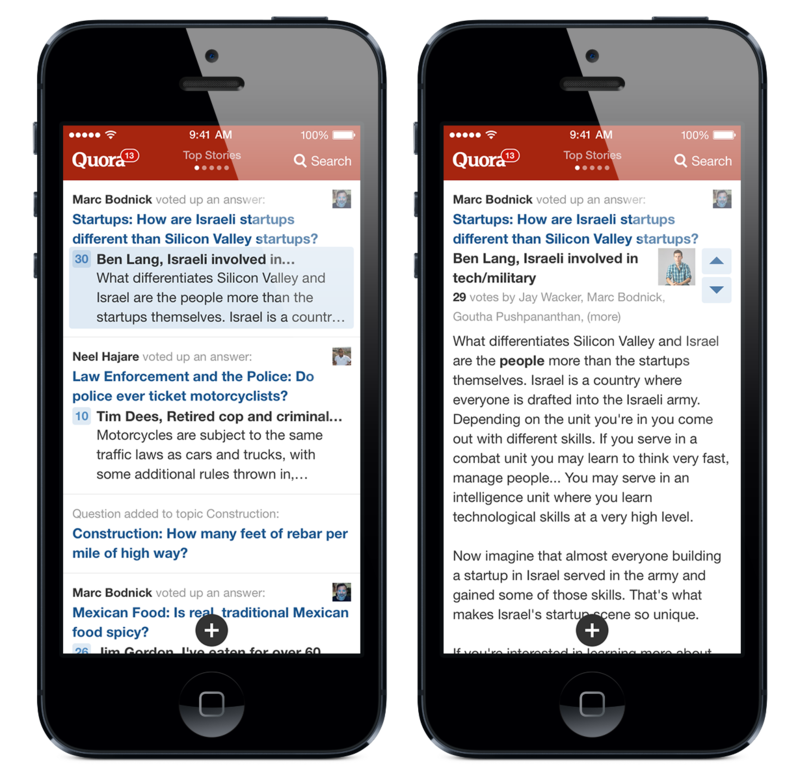 Included in Quora for iOS 3.0 are features to help users browse and discover content just by swiping (no tapping of buttons needed), the addition of multiple feeds, and instant voting right inline on the feed. 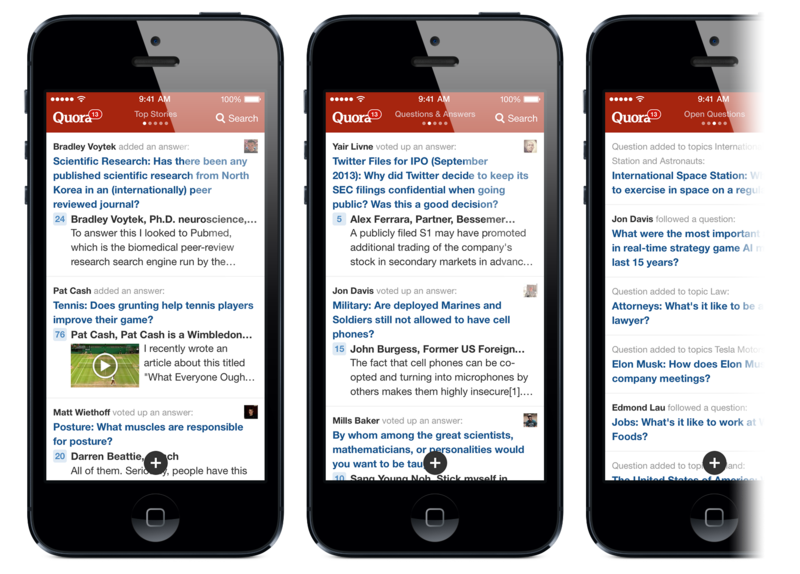 For the past few updates, Quora has been focusing its efforts on helping users create content. 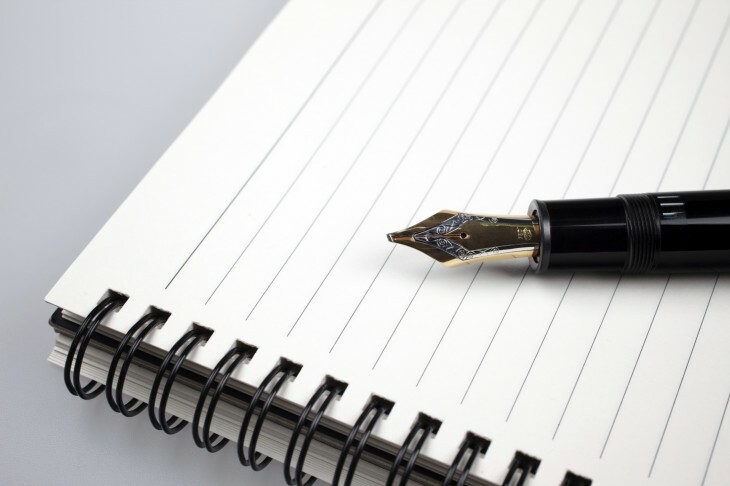 In the beginning of this year, it expanded its offering by becoming a blogging platform and began offering a rich-text mobile editing tool. Several months later, it released another iOS app update with draft answer saving and also predictive question suggestions. Marc Bodnick, who heads up Quora’s business and community teams, tells us that with iOS 7’s emphasis on content, it has opened the doors for his company to make it easier to read and access content. Already, Quora is seeing at least twice as much usage on mobile devices than on desktop, but now it’s possible to remove friction and pain points in getting to content quicker. It has consolidated all of its buttons into one, so if you want to add a question, request reviews, or write a blog post, just tap on the plus button located at the bottom of the screen. Gone from version 3.0 are the menu buttons that Quora feels took up too much time to access information. It’s all about swiping. With its iOS 7 version, the company offers five different feeds that the company claims will give you better control over what you’re seeing. Users can swipe between feeds involving top stories, question and answers, open questions, blogs, and reviews. Lastly, users will find that Quora now lets voting take place inline within the feed. In an effort to emphasize speed, it has removed the friction of needing to open up the question, scrolling through the responses, and voting on the quality of the answer. Bodnick tells us that mobile has been a big success for Quora, and also a priority as the company becomes more mobile-centric as an organization. Already, a third of its audience are using its iPhone and Android apps, but we’re told that that number could go above 50 percent soon. There are more than 400,000 topics being discussed on the service and Quora certainly believes it’s not going to stop there. It’s believed that Quora on mobile works so well because unlike the desktop experience, where you’re sitting there writing every day, you might not get the response you want quickly. But when creating content through a mobile device, users can easily and rapidly post a question no matter when or where you are. And certainly any response can come from a desktop or mobile device in just a few hours. It’s with this notion that Bodnick reveals that Quora is also planning on releasing an iPad app version before the end of this year, something that has been highly requested from its users. Of course, it will blend the best of desktop with mobile and should be especially enticing to those who wish to post more long-form content to the social network.